My husband loves Chinese sticky rice from the dim sum cart, and I was trying to re-create it at home. It took awhile to get family-approved, but it finally worked out, and it can be made in the rice cooker. Please note that I have a Very Simple Rice Cooker. You put the rice in, add water up to the appropriate line, close it, press 'cook' and that's it. Really Fancy Rice Cookers have multiple settings (like porridge, soft, firm, steam) and timers. If you are using one of these, use the setting that you would cook 'normal' rice. 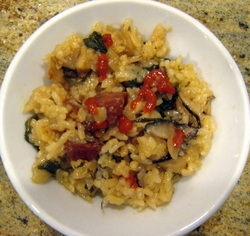 This version of sticky rice is decidedly Feeding My Ohana style--"mixed plate" ingredients and easy-going prep. If you prefer, you can use the traditional Chinese sausage (lup cheong), but I like the less oily texture and spicy/smoky flavor of the Portuguese sausage to balance off the sweet/sticky rice. Drizzle a little sesame oil in a pan and cook the Portuguese sausage until it starts to brown. Add onions and cook until it is soft and also just starting to color. Add mushrooms and then spinach. The final mixture will be a little soggy. This is OK.
Measure out the rice and dump it into the rice cooker. Toss the sausage and vegetables in as well. Add a little more water that what is required for 4 cups of rice; just below the 6 cups mark. Mix in shoyu and oyster sauce. Click the rice cooker on and let it go. Once it finishes, let it steam for about 10 minutes, check to make sure everything is uniformly mixed. Close and let the bottom brown and get a bit crunchy. Spoon into chawan (rice bowls), and top with a little Sriracha sauce.